Tesla shares surpassed $300 for the first time last Tuesday, valuing the electric car manufacturer higher than Ford Motor Company and is now the most valuable automaker in America after surpassing GM with a market value of $50.79 billion. Tesla edged out GM’s $50.79 billion value despite North American auto sales cooling after a period of record sales. Wall Street financiers see tremendous room for Tesla to grow, especially in China where the automaker is backstopped by Asia’s largest Internet company – Tencent. The Chinese tech giant recently purchased $1.8 billion in Tesla stock, giving them 5 percent ownership. Tesla’s gains come after the automaker saw a record quarterly total for vehicle deliveries. Investors were skeptical of Tesla’s prospects because they need to produce 500,000 units to justify their valuation, according to CNBC’s Jim Cramer. However, the global push towards green energy is continuing to trend upwards. So despite Detroit’s “Big Three” automakers holding steady, a spreadsheet is no match for Tesla’s innovative tech setup. The initial jump in Tesla stock price was set off by a brief news release on Sunday that the automaker had delivered more than 25,000 cars in the first quarter, 2,000 more than what Goldman Sachs analysts had predicted. "This is where the future is going. All these metrics don't work. All these metrics would have been true a year or two ago, but Tesla has fought the shorts every way," said Eddy Elfenbein from the blog Crossing Wall Street. "Tesla was burning through tremendous amounts of cash; now they have one of the largest companies in the world, the most valuable company in China backstopping them and giving them a foothold into the Chinese market. 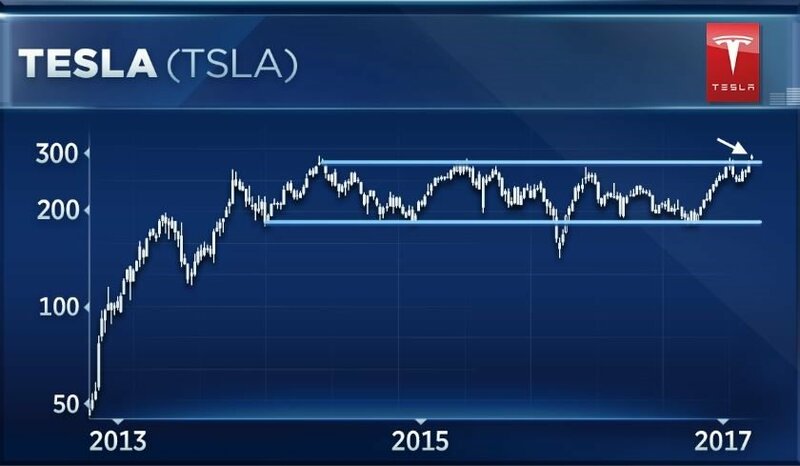 Tesla's an excellent buy right now," Elfenbein said. American automakers have bounced back well from the 2008 recession and are now in a position for sustained growth, that’s why Tesla’s stock soaring by more than 7 percent, while GM and Ford posting a 3.4 and 1.7 decrease respectively, came as a surprise to many. The Big Three’s gains have largely come from increased consumer demand for pickup trucks and sport utility vehicles, however GM received a head start over Tesla with a $49 billion government bankruptcy bailout. This makes Tesla’s success all that more impressive after bleeding money for years, is now finally paying off by leading the push towards the societal shift to electric vehicles. Despite Tesla now having a market cap of about $50 billion, they are still well behind the global sales of Japan-based Toyota, worth $177 billion – three times more than Tesla. Luckily for Tesla and its CEO Elon Musk, several other automakers reported declines, these include Fiat Chrysler and Hyundai. Investors are optimistic about Tesla’s upcoming Model 3, which will sell at $35,000 USD in order to be more appealing to middle-class consumers. If you’re looking to bolster your portfolio, Elite Private Wealth can help with fee-based investing and asset management. Give us a call today at 905-707-5620 or browse our services here.